In November 2002 I received a call from Fred Johansen, grandson of the arctic explorer Hjalmar Johansen. 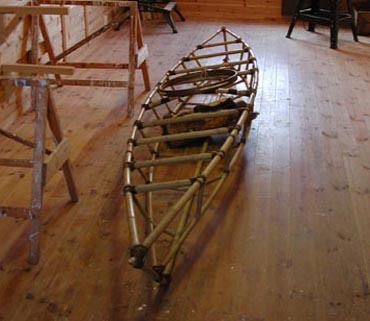 On behalf of his Austrian friend Fritz Heisler, he requested me to build a copy of the kayak that grandpa Hjalmar used together with Fridtjof Nansen during Fram's first arctic expedition 1893-1896. The kayak was to be authentic down to the finest detail, and would be donated to the Polar Museum in TromsÃ¸ in tribute to Hjalmar's memory. 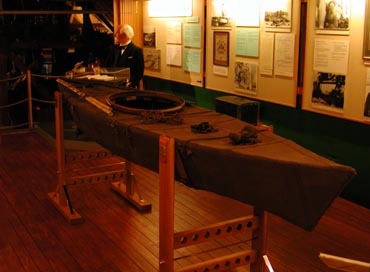 I agreed, and began examining the original kayak, located at the Fram Museum in Oslo. It turned out to be harder than I expected to build this kayak, as the original framework was made from bamboo, and my first difficulty lay in ordering bamboo of the right quality and size from China. The original canvas was made from old sails that had been waterproofed using Nansen's homemade "paint" which he concocted while spending the winter on Frans Josef's Land. The paint consisted of blubber, soot and finely ground polar bear bones. This exact recipe was hard to follow faithfully, so we made do with a lookalike. All patches and rifts from the original were duly noted and reproduced on the replica. 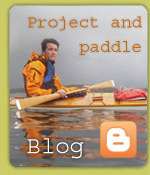 The paddle was an old ski, planed to the shape of a Greenland paddle. This was dutifully copied, tarred and delivered together with the kayak. 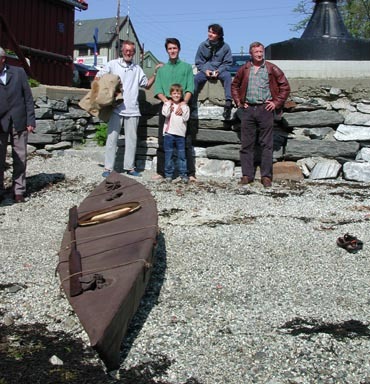 The kayak was donated to the Polar Museum in TromsÃ¸ in June 2003. My son Olav and I were lucky enough to be invited to TromsÃ¸ by Fritz Heisler and his partner. On the photo from the left: Fritz Heisler, Anders Thygesen, Olav Wigen Thygesen, Karin Voigt and Fred Johansen. When the kayak was to be formally presented, a number of journalists and reporters had turned up. We had to test the kayak on the water first. Fritz, who had ordered the craft, was ready for a paddle in TromsÃ¸sundet. The journalists followed us in a normal boat, and the test paddle was filmed from every possible angle. With all the seams and patches, I was concerned whether the kayak would take in water, something the journalists were curious about too. Luckily, it was watertight enough for the test paddle, even if it took in a few drops. Everyone present agreed that this was only appropriate, since the original leaked too!